In the 1980s, casinos in Las Vegas started to notice they were losing money from their slot machines. A man by the name of Tommy Carmichael had designed a tool that could be inserted into the machine and fool the slot machines into dumping out all their coins. Slot machine manufacturers changed the design of their machines, but a few months after the new machines were installed it started happening again. Carmichael was creating new tools to beat the new designs. A key ingredient to being an effective police force is to cooperate with other agencies and your community. This was crucial in this case. What about you? Do you cooperate with others? Then Carmichael started to sell his tools to other cheats. Soon slot machines in cities all over the United States were getting robbed of all their coins. But this was a mistake because when cheating crosses state lines the FBI get involved. FBI agents started to work closely with gaming control board agents and casino security officers. Law enforcement authorities were gathering forces against the cheaters. In 1989 the casinos got a big boost in the fight. Advancements in security camera technology meant cameras could now be installed anywhere and everywhere. Looking closely at the security tapes, casino surveillance officers could watch them over and over, looking for suspicious activity. 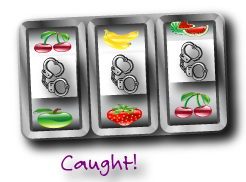 Casino security officers started to catch slot machine cheats in the act and turned them over to the FBI. They questioned them about whom they got their tools from. The name, Tommy Carmichael, was often the answer. Looking back at this story, you’ll see that police and security agencies used the same type of tools the cheaters were using; technology! Then the FBI got a big break in the case. A buddy of Carmichael’s got caught with a slot machine cheating tool in his possession. When FBI agents checked his phone records they noticed a lot of calls to the same number in Las Vegas. It was Tommy Carmichael’s phone number. Nevada Gaming Control Board agents teamed up with FBI agents and immediately put a wiretap on Carmichael’s phone line. A wiretap is a concealed listening or recording device attached to a telephone line. They discovered Carmichael and his friend discussing a new cheating tool that would allow them to steal millions of dollars in a short period of time. The FBI taped the conversations as evidence that would help them make an arrest. When they received a tip of Carmichael’s location at a casino they sprang into action. They followed him around and waited until they saw him using his cheating tool in a slot machine and arrested him on the spot. With the testimonies from the other cheats,the taped phone conversations and catching him in the act, they had more than enough evidence to charge Carmichael with being in possession of a cheating device and manufacturing a cheating device and put him behind bars.